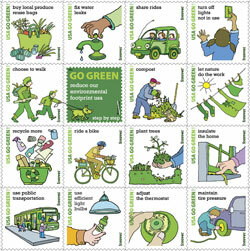 The US Postal Service recently released a set of “Go Green” Forever stamps. The stamps promote various ways to “Go Green” like insulating houses and keeping car tires properly inflated. All sensible ideas. However, something seems to be missing from the list of green tips — a way to go green that would eliminate 40 pounds of paper waste per person every year. How could the Postoffice have missed this tip? Of course, the tip is to cancel junk mail — or “direct/bulk mail” as the Postoffice prefers to call it. No doubt they have a blind spot, since the Postoffice generates most of its revenue from junk mail. 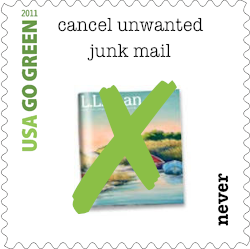 To help fill the gap, I’ve made this “Go Green” Never stamp to promote the cancelation of junk mail. Catalog Choice is a good place to start.